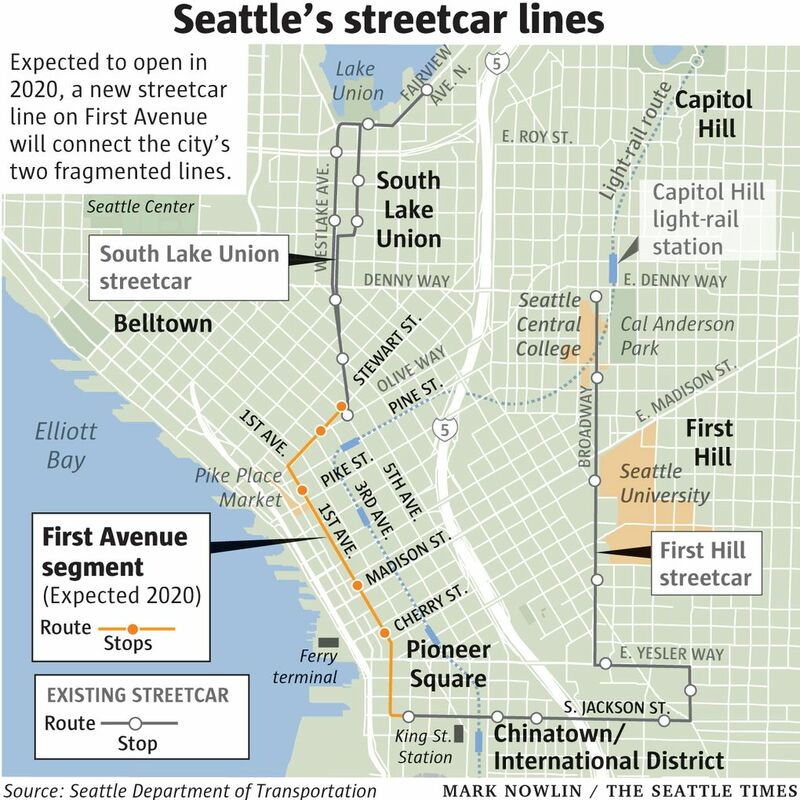 The new streetcar will run in its own lanes along First Avenue, linking Seattle’s two existing streetcar lines in South Lake Union and on First Hill. Construction on Seattle’s new First Avenue streetcar line is well underway and moves to stop the project have not materialized, despite blustery threats from City Council members. Utility work along the line began about two weeks ago. A week before that, at a City Council budget hearing, council members expressed serious skepticism about streetcar expansion and indicated they’d like to see the city spend its dollars elsewhere. The $177 million project will run in its own lanes along First Avenue, linking Seattle’s two existing streetcar lines in South Lake Union and on First Hill. Projected to open in 2020, It includes an anticipated $83 million in federal money ($58 million of which has been secured), but the remaining $94 million would be paid for by local taxes and utility bills. Herbold was not alone in questioning the project. Three other council members expressed concern over whether the new streetcar was the best use of city dollars. But in the three weeks since, as the city budget process has progressed through several rounds of proposed changes, no council member has suggested changing the streetcar’s funding. Herbold, who chairs the City Council budget committee, did not respond to repeated interview requests sent over the last three weeks to discuss the streetcar. The budget process continues through Nov. 20. Herbold’s office also did not respond when asked if she would propose any changes to the streetcar’s funding. She has long been among the streetcar’s most vocal critics, arguing that the project will struggle to meet optimistic financial and ridership projections and that the city’s money would be better spent on expanding bus service. Three other council members joined her in questioning the project at that meeting. Councilmember Kshama Sawant asked if downtown was the most urgent place to invest transit dollars. She repeatedly cited a lengthy attack on the streetcar project by former Councilmember Nick Licata, urging her colleagues to read Licata’s post on his website. But none, so far, has followed up on those questions and concerns with actual proposals. Streetcar defenders, including several downtown business associations, say the expansion will provide a clear, easy route through the densest, most congested part of the city. And, they say, connecting the two existing streetcar lines and providing a one-seat ride from South Lake Union, past Pike Place Market and the stadiums, to First Hill is the best way to maximize existing infrastructure. SDOT projects an exponential surge in ridership once the new line opens — from about 5,200 daily riders on the two lines combined this year, to about 22,000 in 2020. 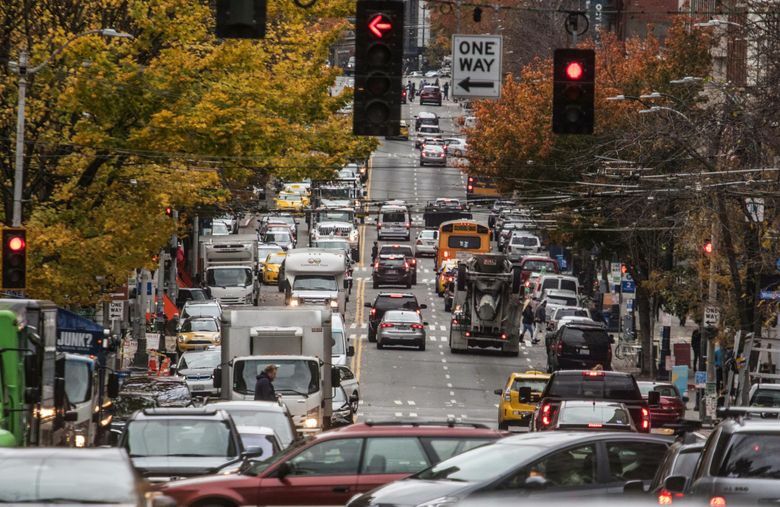 “We have really great transit to get people in and out of downtown, whether it’s light rail or the buses or Sounder or ferries, you can get here,” said Andrew Glass Hastings, SDOT’s director of transit and mobility. “Once you get here, it’s difficult and not necessarily intuitive on how you get through downtown,” he said.